Exact electrical connection of the PE conductor with the case ensures, that in case of failure no voltage can occur to the case because of switching off by the fuse. 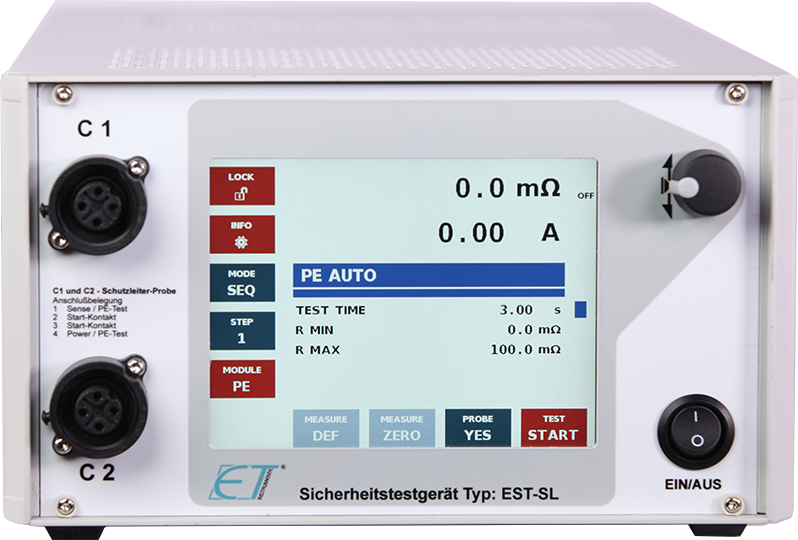 The test of the PE conductor resistance is a very important part of the safety test. With an AC current of 5 A AC to 30 A AC, which is adjustable, change over restistance will be measured in four-wire measurement technique. The measurement range is in standard 0 - 0.2 Ohm. The adaption to the test item appears over a plug socket. Standard Interface is USB, optionally a programming and measurement can occur by analogue-, RS 232- and Ethernet interface. A version without any operating elements -ENC is also available.With the option -EK the case will get smaller from ½ 19’’ width to a euro casette 3 U, 28 TE, 380 mm. The smaller case is only availible with the analogue interface.